Back in the 1950's I played a tethered-ball and paddle game called Jokari so much that I developed a distinct unequalness in the circumference of my forearms. But that aside, it was fun. So, here, I describe it for the web. Some time later (1960's?) I saw a major marketing effort for Jokari in a Sears store . 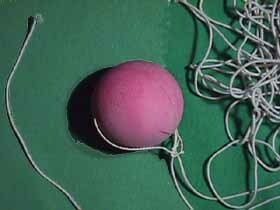 But after that I couldn't find any replacement balls or rubber bands. Once, in 1979, I saw a coed at Northwestern College (Iowa) with a set. Finally, in 1998, I used the web to find Jokari/US's address. On their catalog's last page, under discontinued products, I found an entry for Jokari, the game. Now, with a new ball and rubber tether, I play Jokari with my grandkids, and it is still fun. Pictures of the equipment and the game are below. The usual anchor is a box that also serves to store the ball and string, not a chunk of rail. That box long since was lost in one move or another. This isn't an advertisement, per se, I just remember the game as good, easy, " no-equipment " fun. Any hard surface pad about fifty feet long is plenty big (with no breakables fore or aft). 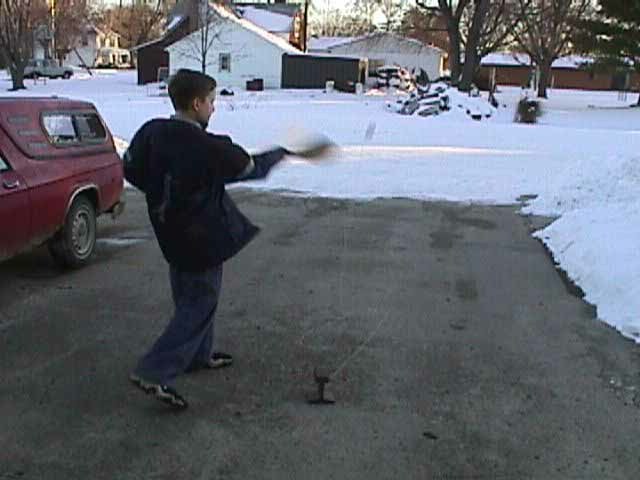 The two person game has two people moving into the hitting zone and out. With four I remember there was a lot of moving in and out. The ball doesn't travel very far behind you if you miss it so there is not a lot of ball chasing. And thank goodness the string does not seem to get tangled to any great degree. And don't forget to put the strap around your wrist. And stay out of the way of your partner's paddle. If there have been any contests or "national events" featuring Jokari please pass that information along to me. Thanks. There's a cartoon (mildly humorous) using Jokari at Laurent's Page. Interesting web site of direct historical connection to Jokari's early development by Alan Jackson, son of the Jokari patent holder. It includes one person and two person game demostrations (using a more tennis-racqueet like paddle). Aside: searching google videos returns clips of various ages and skill levels. They demonstrate the fun. Jokari is a fun game for the whole family. When Jokari started making news and headlines in the US, it became hugely successful. A visit to ebay often shows sets for sale. It looked like the going price was around $30 (US) . European Sources. Some pictures shown do not show a wrist safety strap and the handles aren't wrapped. Both would be easy to add. I invite personal reviews of any sets you have bought recently (Especially those without the Jokari label or from overseas.). Jokari, Inc., no longer supports this game. Here are some pictures. One link found through www.google.com led to a collectibles site - but no Jokari. So I looked at the cached version of the page and the Jokari set there was priced around $250 (US). Whew! But it apparently sold. Assembled by ovk. Last updated 08/28/2015.